By Bob Newman -- In a moving ceremony Monday morning in Cancun, Mexico, Muhammad Ali was crowned “King Of Boxing” during the official opening of the 50th WBC convention. The Arena at the Grand Oasis Hotel held over one thousand delegates who were here for one reason more than any other- to witness the foregone coronation of “The Greatest.” Had Ali not been here on the Mayan Peninsula for the special event, of course the convention attendees would’ve participated in the opening ceremonies, listened to speeches and watched awards being presented. This was different however. This was special. The most recognizable face on earth would show his face here, for a time behind dark sunglasses. The gathering rose almost in unison as the lights dimmed. Ali, with the assistance of his wife Lonnie and an aid, walked across the stage and took his rightful place on a special throne at stage center. WBC president Jose Sulaiman took to the microphone and explained that he has known Ali just about at long at the WBC has been in existence – fifty years. Vitali Klitschko told of how as a young boy growing up in the former Soviet Union, boxing fans had heard of a man called Muhammad Ali, but it was nearly impossible to see the legend in action. Klitschko told friends that he would wear the same belt as Ali had worn, much to the humor of his friends, who thought the boasts unimaginable. “Sport brings the world together and any dream is possible,” said Klitschko, who finished by gently shaking Ali’s hand. Flanked by wife Lonnie, President Sulaiman, WBC champions Vitali Klitschko, Sergio Martinez, Saul “El Canelo” Alvarez and “El Gran Campeon Mexicano” Julio Cesar Chavez, Ali watched intently as a video of his career hilights ran on three large screens. The audience saw the hand of a young Cassius Marcellus Clay being raised after an amateur match when he appeared to be just a young boy, in a grainy black and white film. Footage of Clay winning a Golden Gloves title at seventeen then flickered across the screen, as a brash Clay could be heard narrating over the scenes as they played out. Clay was seen brandishing his 1960 Olympic gold medal with team mate gold winners Edward Crook and Wilbert “Skeeter” McClure. Interview quotes, the “Float like a butterfly” banter with Drew Bundini Brown, and knockout after knockout grabbed the attention of all. The moment all had been waiting for finally arrived. First came the donning of a special robe presented by Chavez and Alvarez. 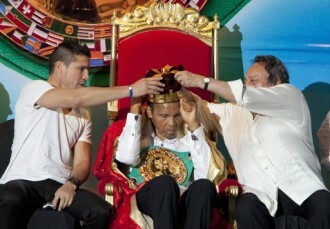 Then Martinez presented the WBC Diamond Belt to the champ. The coronation became complete as current WBC heavyweight king Vitali Klitschko placed the crown upon Ali’s head, to the delight of the audience. Lonnie Ali told the audience that Muhammad was watching his highlight film ever so closely because it featured his favorite subject matter – Ali himself! Lonnie asked President Sulaiman if he could guess what Ali’s first question would be to Sulaiman. Sulaiman waited in anticipation as he was unsure, but knew it would be something only Ali could come up with. “What took you so long?” The crowd roared. She also said that Ali’s regalia of robe, belt and crown, which bore his name across the head band, would be eventually on display at the Muhammad Ali center in Louisville, Kentucky. After a folkloric dance and the “We are The World” WBC theme song were performed, Ali was excused due to his limited energy level. As he rose from his throne and his handlers took off his crown, belt and robe, a recognizable grin spread across his face. He and his entourage headed back to the presidential mansion where they have been staying on the outskirts of Cancun. Upon Ali’s departure, the WBC presented lifetime achievement awards to Hublot Watch CEO Jean-Claude Biver and Quintana Roo governor Roberto Borge Angulo. Biver was instrumental in working with the WBC in creating the Hublot / WBC retirement fund, which held it’s first fund raising auction in Las Vegas last September, raising one million dollars toward boxers retirement fund. As governor of the state of Quintana Roo, Borge Angulo has been a major supporter of boxing in Cancun and throughout the state, of local promoter Pepe Gomez and of the WBC. This afternoon, regional body meetings such as the NABF, OPBF and others will take place along with a meeting of the medical committee. Tonight back at the Arena, the opening banquet and awards ceremony will take place at 7:30 p.m.